Announced today, Playdius and Fun Punch Games are bringing a unique version of dodgeball to the PS4 later this month. What if medieval fantasy battles had played out a little bit more like modern-day dodgeball? 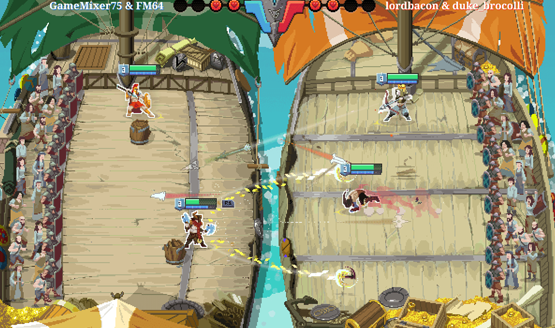 Strikers Edge is competitive arena game that pits competitors in either 1v1 or 2v2 dodgebrawl matches, the fantasy–and decidedly more deadly–version of dodgeball. You can check out all of the action in the release date announcement trailer above. Raise your blade! Developer Fun Punch Games and global indie publisher Playdius are proud to announce the official release date of Strikers Edge, set to launch worldwide for PC on Steam and on PlayStation 4 consoles via the PlayStation Network for North America audiences on Jan. 30, 2018. Players in Europe can look forward to Strikers Edge’s EU launch via PSN for PlayStation 4 on Jan. 31, 2018. Strikers Edge will have eight different playable characters, each with unique skills and movesets that will allow them to out dodge their foes and come out victorious. Whether 1v1 or 2v2, each time will be relegated to their side of the arena and tasked with tossing attacks at the opposing team on the opposite side. Both online and local multiplayer are supported (though it’s not yet clear if you can have two local players against a team of players online). The Strikers Edge release date isn’t too far off. Dodgebrawl competition will be available on the North American PSN on January 30, and European players will get access to it the next day, on January 31.